Cue the ohhing and ahhing. 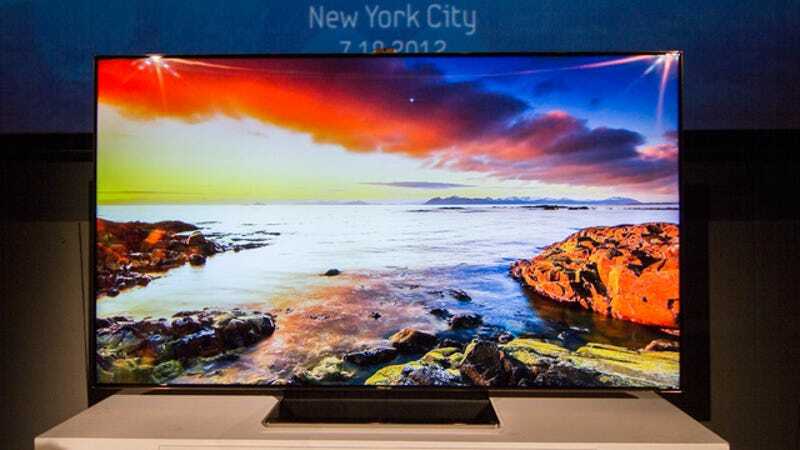 Yesterday Samsung unveiled its new crown jewel—the ES9000, a 75-inch gorgeous giant of a TV. With a super-sharp display and a barely-there bezel, it's hypnotizingly beautiful. At $10,000, chances are, this isn't your next TV. Unless you recently learned of a long-lost rich uncle who left you a fortune. But it was a wonder to behold at an unveiling yesterday. From the back of a large auditorium, the footage of waterfalls and falling leaves was very crisp and clear. Close up, the display is mesmerizingly sharp. The image quality was much more noticeable than a tiny integrated camera meant for Skype calls and gesture-controlled gameplay. The bezel (.13-inch edge) was hardly noticeable—this TV is all screen. One drawback, aside from price—good luck fitting that beast into a typical living room. If your change jar is nearing the million-penny mark, the new TV set comes out in August.